This article is about the journalist. For the investment banker, see Martin Wolf (investment banker). Martin Harry Wolf, CBE (born 1946) is a British journalist who focuses on economics. He is the associate editor and chief economics commentator at the Financial Times. In 1971, Wolf joined the World Bank's young professionals programme, becoming a senior economist in 1974. By the start of the eighties, Wolf was deeply disillusioned with the Bank's policies undertaken under the direction of Robert McNamara: the Bank had been strongly pushing for increased capital flows to developing countries, which had resulted in many of them suffering debt crises by the early 1980s. Seeing the results of misjudged intervention by global authorities and also influenced from the early 1970s by various works critical of government intervention, such as Friedrich Hayek's The Road to Serfdom, Wolf shifted his views towards the right and the free market. Wolf left the World Bank in 1981, to become Director of Studies at the Trade Policy Research Centre, in London. He joined the Financial Times in 1987, where he has been associate editor since 1990 and chief economics commentator since 1996. Up until the late 2000s, Wolf was an influential advocate of globalisation and the free market. Wolf at the World Economic Forum in 2013. In addition to his journalism and participation in various international forums, Wolf had also attempted to influence opinion with his books; he has stated that his 2004 book, Why Globalization Works, was intended to be a persuasive work rather than an academic study. By 2008, Wolf had become disillusioned with theories promoting what he came to see excessive reliance on the private sector. While remaining a pragmatist free of binding commitments to any one ideology, Wolf's views partially shifted away from free market thinking back to the Keynesian ideas he had been taught when young. He became one of the more influential drivers of the 2008–2009 Keynesian resurgence, and in late 2008 and early 2009, he used his platform on the Financial Times to advocate a massive fiscal and monetary response to the financial crisis of 2007–2010. According to Julia Ioffe writing in 2009 for The New Republic, he was "arguably the most widely trusted pundit" of the crisis. Wolf is a supporter of a land value tax. 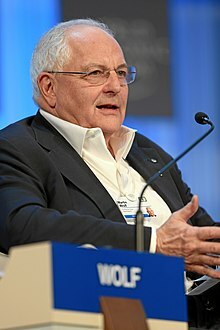 In 2012, Wolf stated in remarks for the Financial Times that public goods are building blocks of civilisation: security and safety, knowledge and science, a sustainable environment, trust, the Rechtsstaat, and economic and financial stability. Wolf is a regular participant in the annual Bilderberg meetings of politicians and bankers. He is visiting fellow of Nuffield College, Oxford, a Special Professor at the University of Nottingham and an honorary fellow of the Oxford Institute for Economic Policy. He has been a forum fellow at the annual meeting of the World Economic Forum in Davos since 1999. Wolf has been named in the top 100 lists of global thinkers by Prospect and by Foreign Policy magazine. Wolf is regarded as "staggeringly well connected" within financial circles. His friends include leading financiers such as Mohamed A. El-Erian; politicians such as Manmohan Singh, Timothy Geithner and Ed Balls; many leading economists; central bankers such as Mervyn King: according to Wolf, he knows all significant central bankers. Despite Wolf's close connections with the powerful, he is trusted for his independence and is known to criticise initiatives promoted by his friends when he considers it to be in the public's interests. Wolf is widely regarded as one of the most influential economics journalists in the world. Lawrence H. Summers has called him "the world's preeminent financial journalist." Mohamed A. El-Erian, former CEO of the world's largest bond investor, said Wolf is "by far, the most influential economic columnist out there". Paul Krugman wrote of him that "Wolf doesn't even have a PhD. And that matters not at all; what he has is a keen sense of observation, a level head, and an open mind." Prospect magazine described him as "the Anglosphere's most influential finance journalist", while economist Kenneth Rogoff has said, "He really is the premier financial and economics writer in the world". In 2012, he received the Ischia International Journalism Award. ^ a b c d e f g h i Julia Ioffe (16 September 2009). "Call of the Wolf". The New Republic. Retrieved 13 September 2010. ^ a b c d e "Martin Wolf – a biography of the chief economist commentator of the Financial Times and author of the book Why Globalization Works". 1 August 2004. Retrieved 13 September 2010. ^ Wolf, Martin (2009). Fixing Global Finance. Yale University Press. p. xi. ISBN 0-300-14277-3. ^ Philippe Legrain (23 March 2010). "Tax the ground they walk on". Prospect. Retrieved 1 September 2011. ^ "Martin Wolf verwacht chaos". De Standaard. ^ "Patron Saint's Day Honorary Doctors". KU Leuven. Retrieved February 2, 2018. ^ "Wolf's info page on the FT". The Financial Times. Retrieved 18 September 2010. ^ a b "Prospect's top 100 intellectuals 2009". Prospect. 2009. Archived from the original on 30 September 2009. Retrieved 13 September 2010. ^ "Foreign Policy Magazine's top 100 global thinkers 2011". Foreign Policy. December 2011. Retrieved 5 December 2011. ^ "Fixing Global Finance with Martin Wolf". The Levin Institute. 2009. Archived from the original on 27 July 2011. Retrieved 13 September 2010. ^ "Who To Listen To". New York Times. 2012. Retrieved 30 July 2012. 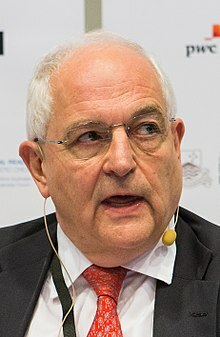 Wikimedia Commons has media related to Martin Wolf.